Churches must find unity in mission, says a new report from the Christian think-tank Theos, published in on the eve of Reformation 500th Anniversary. 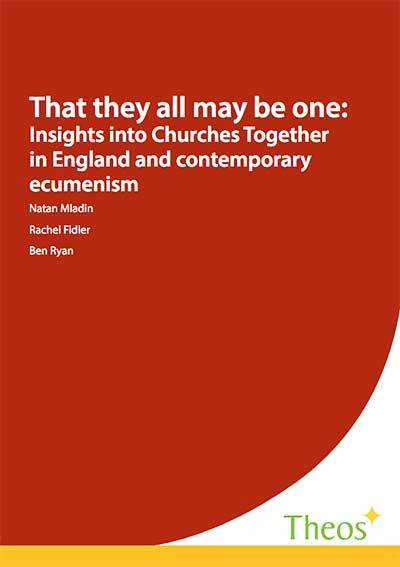 The report, That They All May Be One: Insights into Churches Together in England and Contemporary Ecumenism, provides a snapshot of contemporary inter-church relations in England through a case study of Churches Together in England (CTE), an umbrella organisation of more than 40 denominations. The report draws on qualitative and quantitative data from 63 interviews with church leaders across the country. The report underlines the astonishing variety of English Christianity today and details CTE’s track record in helping cultivate relationships between denominations. In particular, it highlights the efforts that have been made by CTE to reach out to the growing number of smaller, newer or ethnic minority Churches in England that are bucking the trend of Church decline. The report also shows that contemporary work for Christian unity is most vibrant at the local level. Churches collaborate across denominational boundaries, particularly on social action and a majority – 60% – of church leaders interviewed most resonate with the idea of “inter-church cooperation at local level”. However, while there is a clear shift in ecumenical work towards the grassroots, the majority of denominations still want their church leaders to speak out together on major public issues, which raises a challenge given the range of theology and churchmanship between members of CTE. Overall, the report argues that the future of Christian work for unity in this country needs to be outward-orientated, more firmly aligned with mission and witness, facilitated by nimble structures, and fuelled by strong personal relationships. Theos researcher and report author, Natan Mladin, said: “Our report paints an encouraging picture of a new missionary fervour among the Churches in England. Most of the member Churches of CTE are keen to pursue a unity practically demonstrated in service and witness in local communities and beyond. Theos Director, Elizabeth Oldfield commented: “This month the world will be marking the 500th anniversary of the Reformation. Debates about its overall legacy will continue, but it’s clear the Reformation brought about disunity within the Church.